For years we have liked to believe that our phones will replace everything – that bulky camera, that speaker, that laptop… But as we start to throw thousands of dollars at these products, they are yet to free us from all the other products. While we still carry our cameras with us and are nowhere even close to leaving our laptops behind, audio is probably one segment where most users depend on the tiny speakers of a phone/tablet or the pair of headphones provided by the phone makers with the handset. But, there is nothing that could replace a good speaker giving you quality audio. 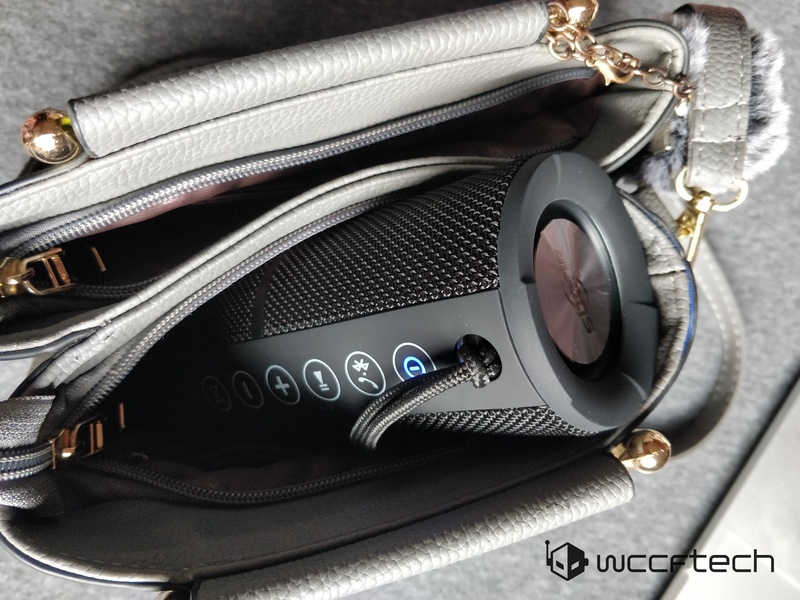 In today’s “Back to School Gift Ideas,” we are looking at a budget Bluetooth speaker that could work as a lightweight audio accessory for a student and could take some wear and tear without needing any special care. 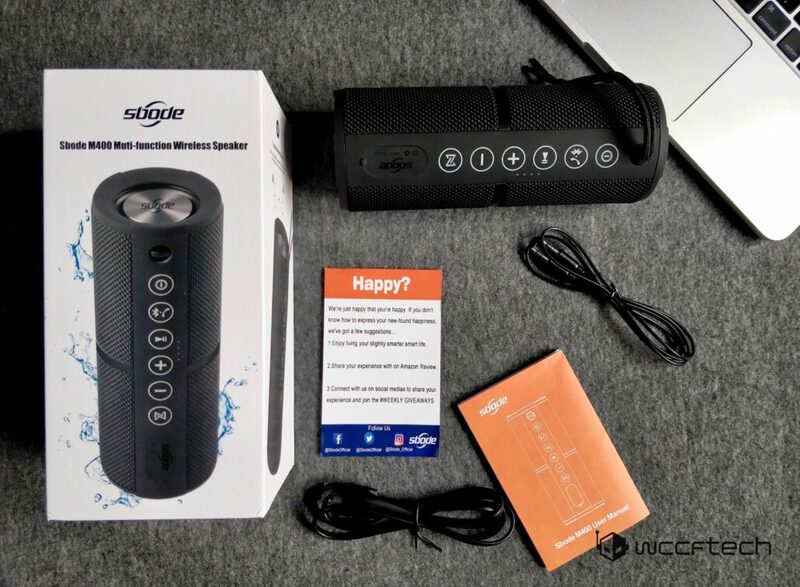 Sbode M400 Waterproof Bluetooth Outdoor Speaker at its original price of $49.99 (and especially at the Wccftech-special price of $37.49) promises to be a strong candidate in the category. Coming to beat the likes of Tronsmart and Anker, this is another company out of China offering you audio products with a quality sound and an affordable pricetag. If you’re buying a gift for someone who loves music but have a limited budget, Sbode offers quite a good choice. With its specs-list (shared below), it’s obviously nowhere close to being the best or a premium audio product, but looking at the promotional price, it will be hard to find something that is equally feature-rich, durable, and affordable. Bluetooth speakers are all the rage, but do they come with enough features? 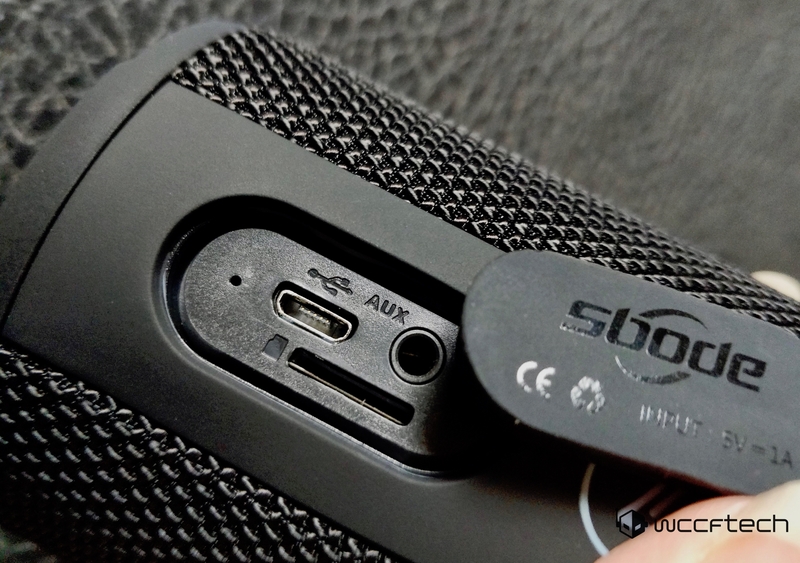 Opening the box of Sbode M400, you will find the standard accessories: a micro USB charging cable, aux cable, user manual, and the speaker itself. Sbode not only offers you a wired option but also has a microSD slot for when you don’t want to rely on your phone for music. One standout feature when it comes to design is how it feels in your hands. The product has a woven mesh kind of material that gives it a softer and yet rugged look and feel. With the height coming off a little less than 8 inches, this product beats quite a few competitors for its compact and portable design. There are a number of control buttons on the front – hard to say if it’s a front since this is a 360-degree surround sound system – that allow you to make a quick call, move the playlist around, change tracks, or control volume. Open the small flap and you will see micoSD card, charging and aux slots being housed. While it comes with all the regular features, Sbode also adds in a built-in FM Radio – an addition that I absolutely loved. 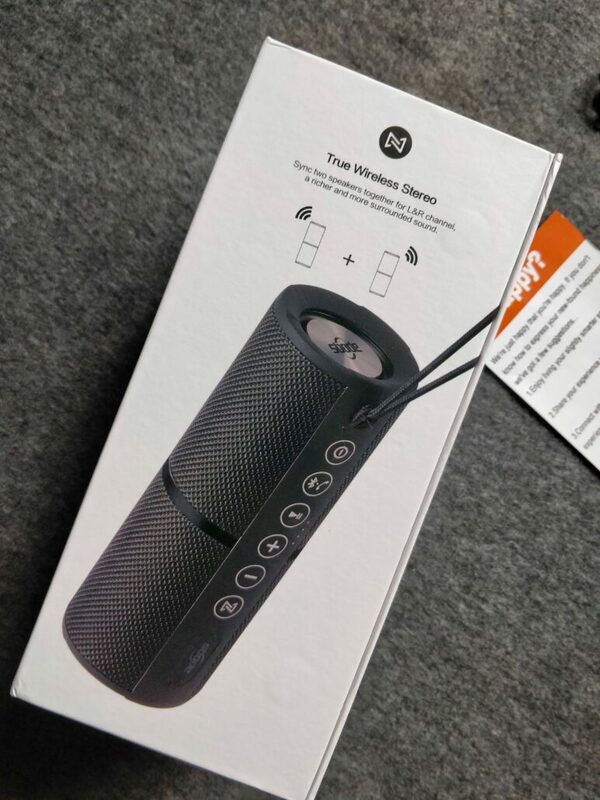 Since this is being marketed as a portable, outdoor speaker, it makes sense to have a storage slot and an FM option to be able to enjoy a range of audio entertainment without having to rely on your phone for input. 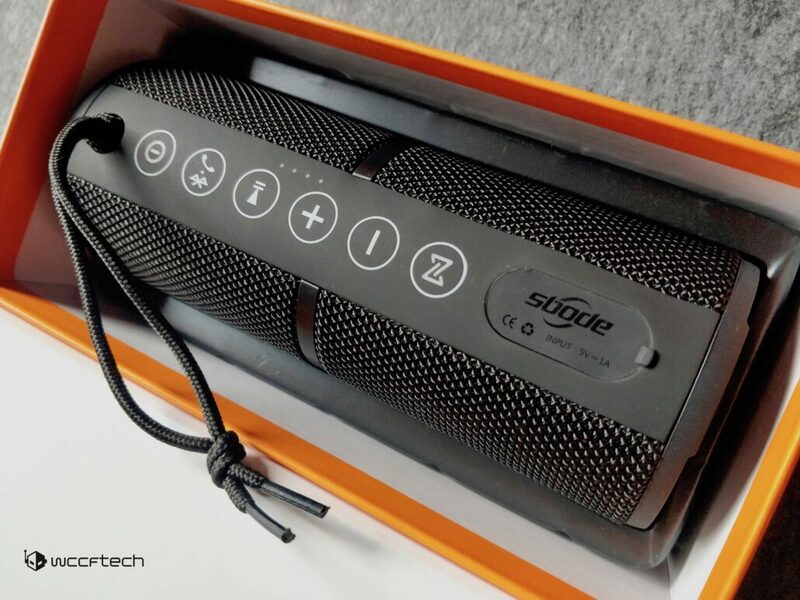 Setting Sbode up is as easy as any other Bluetooth speaker. Simply power it up and it would appear in the list of available Bluetooth devices on your phone or laptop. Connect it and that’s it. You can, of course, also use the aux cable for wired connectivity. As for sound, the product does a good job. While some of our readers have previously called budget audio products as “nothing but crap,” we have to remind ourselves that not everything has to be compared with that $2,000 audio setup. This is a budget speaker; it says so on the cover. Sbode M400 is a no-fuss, no-fancy product that does the job well. Would I replace my home entertainment system with it? No. Would I carry it with me on the outdoor runs? Definitely. That disclaimer aside, Sbode promises 360° surround sound that makes listening to music uniform and enjoyable – perfect for outdoors. Unlike several other cheap speakers that we have tried, thankfully, Sbode does a good job with audio, without giving any major drops in quality. You can experience a range of sound without any breaks, and for its size and features, it’s certainly loud. The product offers well-balanced bass, treble and mid-tones, which is a rarity in this price bracket. Coming back to the theme of our review, its compact design, loud bass, good quality of audio, and its price point make it a strong choice for a back to school gift. While it has a respectable sound quality and range, I couldn’t help but compare it with Tronsmart’s Element T6, which is also available for a similar price. Sbode is a perfectly fine little speaker but Element T6 is notably louder and gives a stronger bass performance. However, every product comes with its own set of pros and cons. Element T6 is slightly bigger and heavier, which affects its portability and more importantly, it lacks a microSD card slot, which is a bummer. Add in the currently ongoing promotion on Sbode that brings the price to less than $40, it makes it a better and more affordable choice than many. At the end of the day, it depends both on your budget and your requirements. If you are someone into heavy bass, I would suggest investing a few extra dollars and going for Tronsmart. 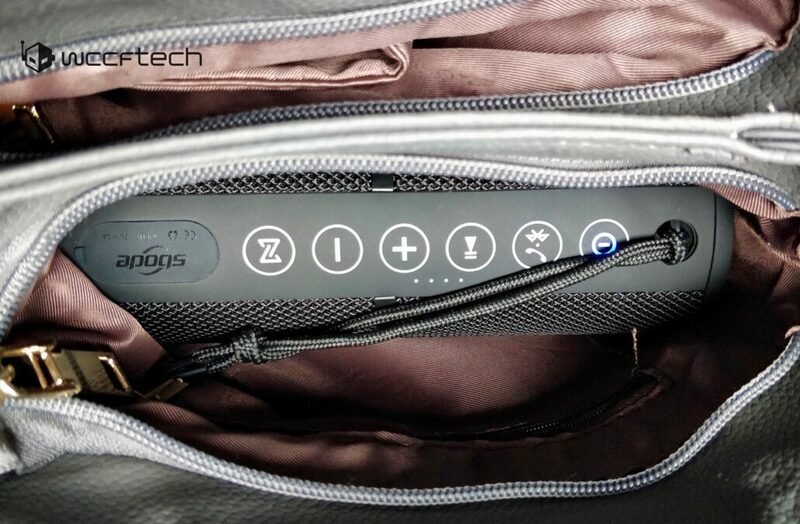 But if you want true portability and the option of microSD card slot and FM radio then Sbode is a no-brainer. One thing I would add here is that Sbode offers True Wireless Stereo when you connect two speakers together. Since I only had one unit, I couldn’t try this. But looking at the output of one, I’m assuming it would result in a far better and crisper experience if you do connect the two units. For the promotional price point of $37.49, I doubt you can find any better alternative. If the company has managed to offer so much in such a compact form factor, I’m already curious as to what it can deliver if Sbode isn’t limited by weatherproofing and portability. 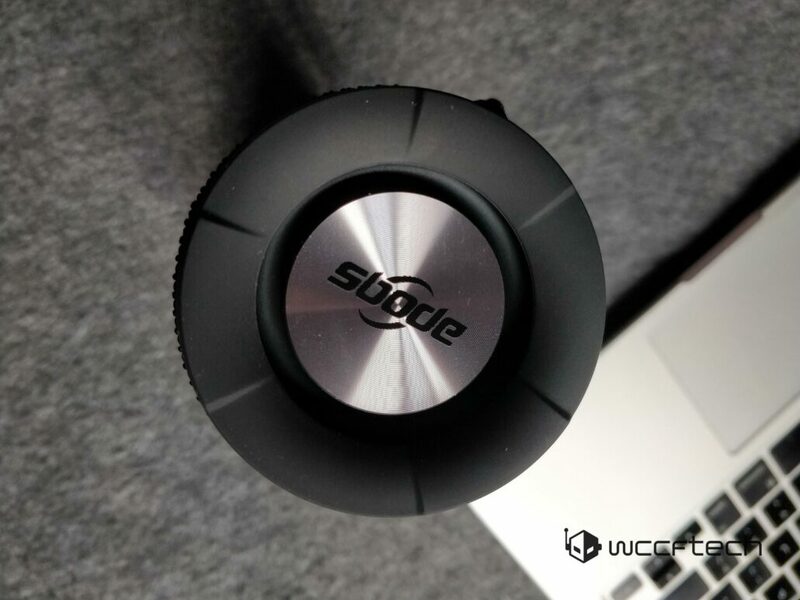 Sbode M400 is a sturdy, affordable, and weatherproof portable Bluetooth speaker. With its promotional pricetag, it’s hard to find something that is equally feature-rich and offers decent audio quality.